Modern science is starting to confirm the health benefits of a vegetarian diet (Leitzmann, 2005). SSRF has found that in addition to health benefits, vegetarianism facilitates spiritual growth as well. Many seekers of God have found that the quality of their spiritual practice improved by adhering to a vegetarian diet. In relation to sāttvik living, diet is an important aspect of a person’s daily routine, which has a major impact on his or her health and consciousness. The main reason is that unlike other stimuli, food and drink is something that one ingests and it directly impacts one from the inside. Using a Universal Thermo Scanner (UTS), the Maharshi University of Spirituality conducted an experiment to find out the difference in impact of a vegetarian versus a non-vegetarian diet. This instrument is used to measure the energy and the aura around any object (living or non-living). It has been developed by Dr Mannem Murthy, a former nuclear scientist from Hyderabad, India in the year 2003. It can measure distressing vibrations along with positive vibrations emitted from an object. It is also able to measure the extent of the aura of the object into the surrounding area. When taking a measurement, the 2 arms of the scanner open out and the reading is taken based on how much the arms opened out in degrees. The spiritual research team has used this instrument to measure changes in various objects (living and non-living) after being exposed to various stimuli. For more information refer to the product page of the Universal Thermo Scanner. 2 individuals were asked to take part in the experiment. At the time of the experiment one of them was at a higher spiritual level of over 60%, while the other seeker was below the 60% spiritual level. Both seekers at the time were not suffering from any spiritual distress. The significance of the spiritual level of 60% is that one gains liberation from the cycle of birth and death. At this level, one is also more sensitive at a spiritual level to one’s surroundings. On 25 Dec 2016, both seekers for the purposes of the experiment were asked to eat the same dish of chicken and fish along with rice and chapātī (an Indian flatbread) for lunch from the same restaurant. A reading with the UTS was taken before their meal and after they came back from lunch. Both seekers continued to eat their regular vegetarian diet after their one non-vegetarian lunch meal. 2 days later, on 27 Dec 2016 when both seekers ate the vegetarian food that is served in the Spiritual Research Centre and Ashram for lunch, readings before and after their consumption of food were recorded using the UTS. The UTS instrument allows one to measure 4 types of energies emitted by a subject: infrared, ultra-violet, positive and total measured aura. The readings before and after ingesting a meal are listed below for all the 4 types for both seekers. Only if both the arms of the scanner open out to a full 180 degrees can the distance of the aura of that aspect be measured. If the arms of the scanner open to less than 180 degrees, then it means that there is no aura in relation to that aspect. The seeker below the 60% spiritual level developed a negative aura after eating non-vegetarian food, while the seeker above the 60% spiritual level did not. This may be because the innate positivity of the seeker above the 60% spiritual level counteracted some of the negativity of the non-vegetarian food. Based on the readings, it is likely that the seeker above the 60% spiritual level only recouped a small portion of his positive energy 48 hours after eating non-vegetarian food. This is indicated by the 30° angle made by the scanner (when compared to the baseline angle of 180°). The angle made by the scanner only increased from 30° to 45° after eating this particular vegetarian meal. This was a marginal increase towards his baseline reading and it in all likelihood shows the gravity of the impact of eating non-vegetarian food. To capture the total measured aura, a small sample of the subject (to be measured) is required to be inserted into the UTS. In this case, some saliva from the subject’s mouth was used. Negative energy increased in the subjects after eating non-vegetarian food. This is indicated by both the infra-red (IR) and the ultra-violet (UV) energy increasing in both the subjects after eating non-vegetarian food. Seeker A who is below the spiritual level of 60% developed a negative energy aura in the IR parameter to the extent of 1.06m. There was also an increase in UV (negative energy) for this seeker. 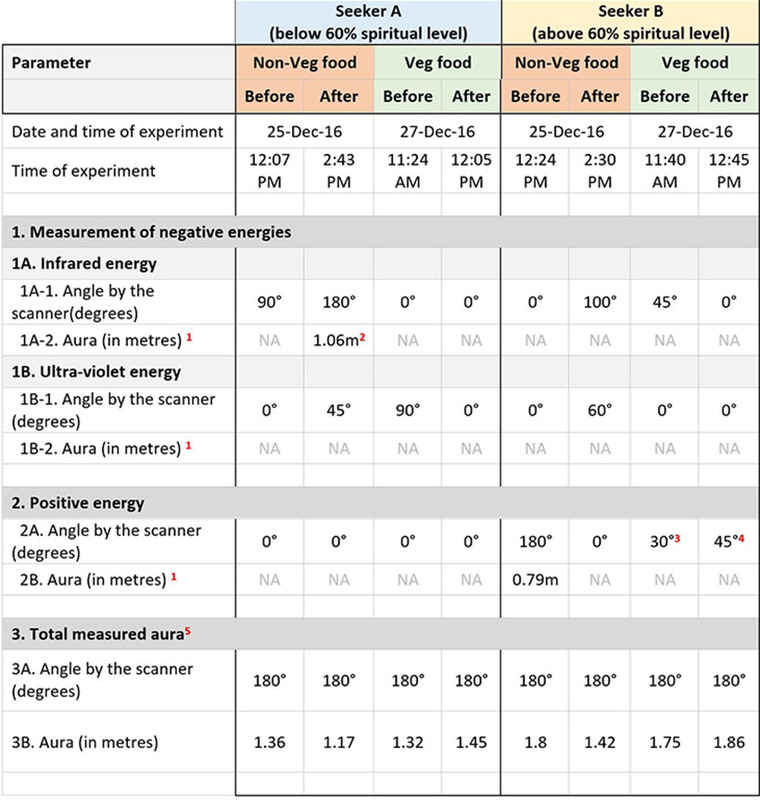 Seeker B who is above the 60% spiritual level gained negative energy as the angle of the arms increased from 0° to 100° in the IR and from 0° to 60° in the UV parameters. Here are some additional points of interest regarding him. He completely lost the 0.79 m positive energy aura that he had around him before eating the nonvegetarian lunch meal. Two days later when the vegetarian food experiment was conducted, it is likely that he recovered in part from the negative subtle energy imbibed by eating non-vegetarian food. This is indicated by the reduction in the IR parameter from 100° 45°. Also, please refer to footnotes 3 and 4 given below the table. The Total Measured Aura (Point 3 in the above table) contracted in both seeker’s cases after consuming non-vegetarian food, which is a negative sign. In the case of both seekers, whenever they had a negative reading before the vegetarian experiment, it has reduced after eating vegetarian food from the ashram. This was reflected in the arms of the scanner showing 0° in all of the readings pertaining to negative energy measurements after having a vegetarian lunch. Positive energy increased in seeker B whose spiritual level is above 60%. However, he appears to regain the positivity that was lost by eating the non-vegetarian food slowly. (Such is the negative impact of non-vegetarian food on the system). Overall, the experiment shows the importance of a vegetarian diet in increasing positivity and reducing negativity. On the other hand, non-vegetarian food increases Raja-Tama in a person. The “Vegetarianism in America” study published by Vegetarian Times showed that a mere 3.2 percent of U.S. adults, or 7.3 million people, follow a vegetarian-based diet (ref: vegetariantimes.com). Worldwide statistics are similar in percentages. India is an exception where vegetarians are estimated to be 30% of the population. Ingestion of non-vegetarian food by the vast majority of the world’s population is one of the causes of the high Raja–Tama that is prevalent in the world today and it also has a direct impact on the degradation of human values and the instability of the human mind. We appeal to scientists who are interested in carrying out further research on the effect of vegetarian and non-vegetarian food on consciousness to contact us using our contact form.